Published March 3, 2018 by Jovana R.
Make your skin silky smooth like fresh melted chocolate – these DIY chocolate face mask & scrub, hair mask, lip scrub and lip balm ideas are the sweetest things your skin and hair can get! Chocolate has won our hearts ever since we learned how to make hot, steaming, creamy beverages out of the bitter grain of cocoa. It became a huge part of our meals, special moments, best memories and everyday lives in general. It was only a matter of time for chocolate to find its way into skincare. Today, chocolate is the main part of some luxury spa treatments. Prestigious hotels and spa centers offer chocolate body wraps and massages, mani-pedis, scrubs and facials. Just thinking about sinking into one of their chocolate baths can make your toes curl and tingle. Chocolate spa treatment can be a perfect way for you to relax, be pampered and add something really special to your day. Or it can be a caring, romantic gift for someone you love. Cocoa contains glycerides, which moisturize the skin and prevent aging signs. Theobromine improves circulation. Theobromine is a substance that has much in common with caffeine. Its ability to speed up blood flow ensures better looking skin, but also means that chocolate has a slimming effect on the body. Not when you eat it, though. But that is why chocolate is included in body wraps in some salons, as a part of body contouring programs. Did you know that chocolate contains more antioxidants than green tea? Chocolate is rich in polyphenols. These antioxidants fight free radicals and slow down the aging process. Cocoa butter moisturizes, softens and smooths the skin, improves skin’s elasticity and keeps it well-nourished and radiant. Minerals that chocolate contains, like copper, zinc and iron, stimulate new cell growth. DIY chocolate face mask regenerates and rejuvenates the skin and gives you fresh, youthful look. Improved circulation in the scalp means chocolate promotes hair growth and reduces hair loss. It also makes your hair glossy and adds volume. Chocolate DIY beauty products are more than just skincare goodies. The scent of chocolate relaxes us. It stimulates endorphin production, which makes you feel good, relaxed and at ease with the world. It reduces the stress and that reflects on your looks. The scent of chocolate stimulates the release of serotonin, which also happens when we are falling in love. And who doesn’t look good when the cheeks heat up and the eyes sparkle? Have a piece of chocolate you don’t want to eat (Ha!)? Use it for a dreamy, aromatic DIY chocolate face mask. 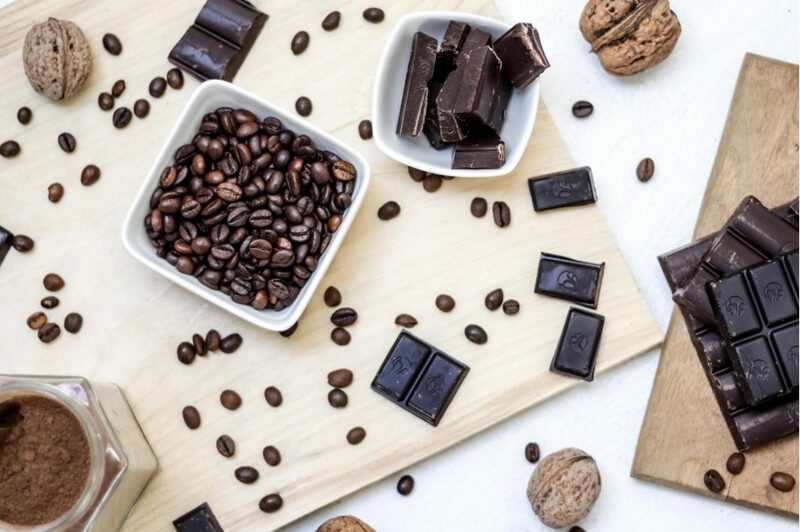 Dark chocolate is much better for your skin than milk chocolate, so make sure to use high quality dark chocolate, with as high percentage of cocoa as you can find. Mix all the ingredients well. Apply to a clean face, preferably after scrub. Leave it on for 15 – 20 minutes, then wash off. During fall and winter, you should apply this mask at least once a week. Mix well cocoa powder and Aloe Vera gel. Soak a cotton ball in milk and wipe your face with it. Then apply the mask. Leave it on for 15 minutes, then wash off. This face mask is one of the best DIY beauty products when you need something to purify and detoxify your skin. Besides, it is very practical because you can mix all the dry ingredients, keep them in a jar and just use a small amount every time you feel your skin needs deep cleansing. To make detoxifying DIY chocolate face mask, mix kaolin clay, cocoa powder and matcha green tea. Transfer the mixture into a glass container. When you want to use the mask, mix around 1 tablespoon of the mixture with just enough water to get a smooth paste. Apply to a clean face and wait 10 minutes or until it dries, then rinse off. Melt the chocolate. Let it cool down just a bit. Add the honey and mix it in well. Then add the sour cream. Apply to a clean face. Leave it on for 15 – 20 minutes, then wash off. If out of all these chocolate face masks you want to try out just one, make sure it’s this mask. Melt the chocolate and remove from the heat. Add the shea butter. Stir occasionally while the warmth of the chocolate melts the butter. If needed, warm up the mixture again. Once your mixture is well combined, apply it to a clean, freshly scrubbed face. Leave it on for 20 – 25 minutes. Melt the chocolate and let it cool down a bit. Add egg yolk and mix it in well. Add mint and vitamin E essential oils. Apply to clean face and neck and leave it on for 15 – 20 minutes. Remove the mask using a cotton ball soaked in milk. Rinse off your face with lukewarm water and apply your moisturizer. Mix all the ingredients. If your mask is too runny, you can add cocoa powder or oat flour. This mask does a great job of refreshing and toning your skin, so make sure you include it in your beauty routine once every 1 – 2 weeks. Keep it on your face for around 20 minutes, then wash off. Yes, yes, chocolate DIY beauty products have their place even in hair care. This is primarily DIY chocolate face mask, but you can use it as a hair pack as well – it has numerous benefits for your hair. But don’t use it if you have blonde hair. Mix melted chocolate with mashed avocado. If the mixture is too thick, you can add a bit of milk. You can use this mask on your face or on your hair. After 20 minutes, wash it off. This highly moisturizing, nourishing DIY hair mask can do wonders for your hair and scalp! Get dark, quality cocoa powder. Melt the coconut oil. While it’s still hot, add the cocoa powder and stir. Wait for it to cool down a bit before adding the Greek yogurt and lavender essential oil. Mix everything together well. Apply after shampoo to damp hair. Leave it for 45 – 60 minutes, then rinse out and shampoo your hair one more time. Melt the chocolate. Add coffee grounds, jojoba oil and vanilla essential oil. Mix all well together. As soon as it cools down enough not to burn your skin, apply to a damp face. Massage your skin in slow, circular motions for about 5 minutes, then leave it on for 10 more minutes. Wash off with lukewarm water and a gentle cleanser. You can use this scrub during shower to exfoliate your whole body. If you want to use it on your face, omit white sugar and instead double the amount of brown sugar. You can follow this scrub with a DIY chocolate face mask. Chocolate sure has a way to make DIY beauty products look and sound like desserts :-). Chop the hazelnuts as finely as you can. Then put them into a mortar and grind a little, but not to a paste. Mix cocoa powder, sugar and hazelnuts. Add hazelnut oil and stir until everything is well combined. Apply during shower. Take your time and massage it in well. Wash it off using a gentle shower gel. Mix all the ingredients. Transfer your scrub into a small glass container. Use a small amount to gently exfoliate your lips for 1 – 2 minutes. Remove the scrub from your lips using a paper towel. Apply a lip balm. Keep the scrub in a cool, dry place and use it once a day. Combine chocolate, cocoa butter and jojoba oil and melt everything slowly on a very low heat. Remove from the heat and add essential oils. Pour the mixture into a small glass container. Wait until it cools down, and your chocolate lip balm is ready to use. I hope you’ll enjoy treating yourself with these adorable DIY chocolate face mask and scrubs, hair masks and lip products. They are sure to put a smile to your face and make you feel relaxed and pampered. Next Post Facial At Home in 9 Steps – You Owe It to Your Skin! I’m extremely inspired together with your writing abilities as neatly as with the layout on your blog. writing, it is uncommon to peer a nice blog like this one today.